I hope you enjoy it. My pears are done for the year, I am now moving on to apples and plums! Thanks friend. Have a wonderful week. Wow, Shari, this sounds amazing! And I don’t even like pears… I know, what’s wrong with me? Thanks so much for sharing it at Savoring Saturdays! We all have our own special tastes. Loved your party, there is always something good to explore. Have a wonderful weekend. Goodness! Everything always looks so good on your site! Thanks for linking up at Saturday Dishes!!! Pinned! You are so sweet Lisa, thank you. It was my pleasure to join the party, always a great time. This look yummy. I haven’t done a lot of baking with pears since they seem so delicate but when I was in pastry school we made a blueberry pear tart that was delicious. I brought it home for Thanksgiving and it was gone quickly. Thanks for sharing this with the #yuckstopshere link party. It is always a pleasure coming to your party. The blueberry pear tart sounds amazing. Some day I would love to spend some time in pastry school. How cool is that? Have a wonderful weekend. Is it possible to need to reset all the time…lol. Actually, all I need to reset is some quiet time and I’m all good. Your recipe looks fantastic as always. I don’t think our pear tree has anymore pears on it, but I haven’t looked at lately (bad me). Do you recommend a certain type of pear for this recipe? I definitely have to reset daily 🙂 Thanks for the kind words and stopping in to share. Girl…this looks so delish! Yes, it would go great with coffee, wouldn’t it? Thanks Bobbi. It went perfectly with coffee! Shari this is a wonderful mouth-watering cake!! Robyn @ simply fresh dinners recently posted…GIVEAWAY – Sweet Debbie`s Organic Treats Cookbook! Thanks Robyn. I am all about the dessert 🙂 my sweet tooth is tremendous. OH DEAR… my mouth is salivating!! This looks so yummy, Shari. Thank you! I am glad you enjoyed it and I appreciate you stopping by to share. Love Starbucks and I entered for sure! This looks delicious – thanks for sharing the recipe at the #WWDParty. Thank you. Always a pleasure. I want a piece right now! I could eat this for breakfast right? Pinning! Absolutely! Lunch and dinner works for me too! Brown butter anything is amazing!! I bet this cake is a keeper. Thanks for sharing, Shari! Simply Suzannes at Home recently posted…early September . . . Thanks Suzanne. This is the first time I have worked with brown butter and I have a feeling it wont be the last. Thanks for stopping by, It’s always a treat. 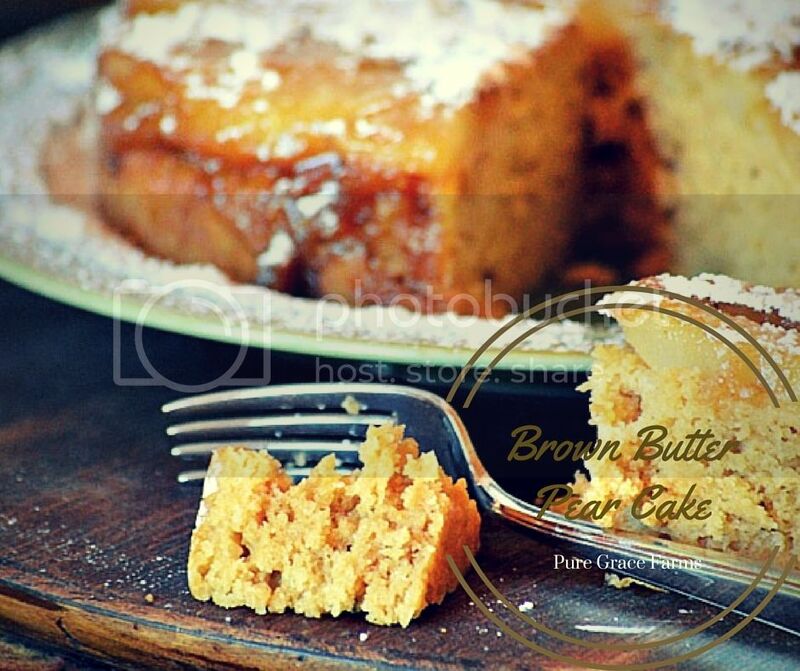 Your Brown Butter Pear Cake looks super moist. I would love a piece with my coffee anytime. I also enjoyed reading about taking time for yourself. We have 6 more years before my youngest will be finish high school. My husband and I adopted later in life so (my husband, Caleb, and I) will definitely be ready to slow down after Diana graduates. I never have time for much with 5 kids and all their activities plus my husband working out of town. I have kids in public school, private school (he is a senior), and I homeschool. Wednesday, Thursday, and Friday of this week I am working on feeding my sons high school football team their meal before the game. I only have to do this once or twice a season. I like to see their faces when they are eating, but it is a lot of work. Thanks for this delicious looking cake. Thank you Diane, the cake is perfect with coffee. I have to admit to sneaking a piece for breakfast. It’s perfect because it is not too sweet. It sounds like you have a full plate with all the kids. Enjoy it, for soon the house will be much more quiet and you will be wondering where all the time went. Have a great, chaotic and busy weekend and enjoy every minute of it. Thank you Janine. I am on the homestretch and sitting in the airport ready to make the return trip home. Refreshed, renewed and ready to rock! Have a great weekend.